Join the discussion on our forums! Come discuss Grimestreet Protector over in our dedicated Grimestreet Protector discussion topic. Some new asphalt should do the trick. Disgusting Arena value. It 's just like Flamestrike for Paladin on turn 7. My God, that card is strong! In buff decks it is like 8/8 taunt plus trade-off this tour for free. I love it! I hope I get golden one or just craft it when I get some spare dust. can someone explain reference in flavor text? The name of the card.... maybe? Some new asphalt could do the trick of protecting the grimestreet (Grimestreet Protector). Not the most clever of writing if that's the joke. Best arena card in gadgetzan. Maybe Kabal Talonpriest as alone is better, put priest is still bad in arena. what makes this card great is not the ability but rarity. we who don't throw money at this game don't have access to tons of cards let alone tons of golds. this being just rare helps players like me get him hopefully with not too many pack openings. that and crafting is possible too so i am happy about it. you're rating this card by it's rarity? you have the same chance to get this as an angry chicken, does that make that card good for f2p btw? 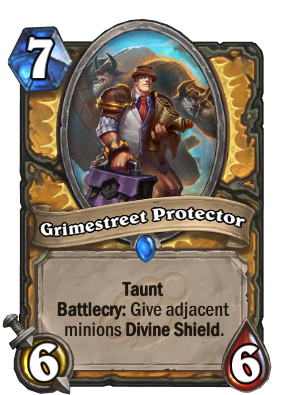 I really like the artwork tho he is like the lawyer of the Grimestreet maffia protecting them at the Gadgetzan court. this card should be a 3 mana - 3/3 minion still the same description and activity. Nah that would be broken, the stats are too good and having this effect on a 3 mana card is insane cuz you can combo it out with other divine shield buffs or effects.